Beyond Marathon hire out both Professional RFID Race Timing systems, and also offer an ultra low cost chip timing solution based around NFC technology in mobile phones. The decision as to which is most appropriate is easy. RFID stands for Radio-Frequency IDentification. RFID tags are small electronic devices that consist of a small chip with antenna. Each participants wears one. 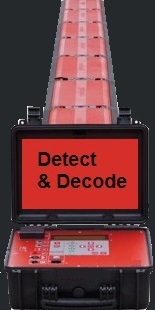 On the finish line there is a detector / decoder, which receives and processes the radio data from the chip as it passes. RFID chips/tags comes in various form-factors; most commonly split between single-use and disposable. An example of a single-use RFID application would be the race bib pictured. On the reverse of the race bib are two RFID chips/antennas. Two chips means highly reliable detection, suited for events from a few participants up to 10’s of thousands. Another example of single-use RFID tags would lightweight plastic tags that thread into shoe laces. An example of reusable RFID tags are the arm/ankle tags pictured above. These are the same RFID technology, packed into a sturdy, 100% waterproof plastic housing. These tags are used both on running, cycling and most popular for triathlons. Reusable tags also come in the form of batons for relay events. To detect the chips, on the finish line, and perhaps at interim/transition checkpoints, is a detector / decoders. Our decoders are professional, and waterproof. Finish line detectors for running events are most commonly heavy duty plastic mats (the aerial) around 5m wide which sit underneath the start/finish line arch/gantry. They can also be free-standing aerial structures which sit roadside, or lightweight cables which are taped down across a road. Which is used depends entirely on your individual requirements, and sometimes the geography or restrictions placed on you by land owners. The decoder runs off a mains, or battery supply. It can be connected directly to a laptop, store data on a USB drive, or it can be fitted with a 3G SIM card. Where internet access is possible, the data is sent live to the results website for immediate viewing. When timing is critical to your event, no matter if it’s a local 10k or national event, your reputation is on the line. Reliable timing is priceless, and you only get one chance to get it right. It’s money well spent. Cutting costs on timing and opting not to use an RFID system like the ones we hire could end in loss of results/data and reputation damage. We offer the highest detection rates, so accept no substitute for timing. Our RFID system is world-class, and used in international marathons. So if you are looking for Running Event Timing. Sportive Timing, Triathlon Timing, or GPS Tracker Hire, some and speak to us. Hiring a Timing System for the day, starts from as little as £250.00 including a professionally trained operator. Reusable RFID tags are hired from £1 per participant. Our advice is always free. Get in touch and tell us about your event. As an alternative to professional RFID systems, which are expensive to hire and buy, we developed this for small organisations who simply cannot afford the high setup and ongoing costs of pro timing systems. If you have a low volume, non-pro event, then this could be what you are looking for. My name is Richard Weremiuk, and I am an events and race director. I facilitate use and hire of these systems to meet the primary needs of other race directors: Accurate timing, improved race safety, publicise your events to a wider audience. We have an app (costs £5) that will allow scanning on NFC chips/tags, manual entry of race numbers, or it will scan bar codes. The example below shows the timing chip on a race number, but one of our most popular chip formats is a wristband. You can buy NFC tags in various formats from just a few pence per tag from many online retailers. You can program the tags quickly and easily using the free App “TagWriter”. The beauty of the system is that you probably already own all the hardware that is required. It is based around use of your mobile phone as the timing chip scanner. Android phones now have 81% of the smartphone market share, and so we have created an Android App that is able to scan NFC radio chips. Virtually all Android based smartphones (Samsung, HTC, Sony etc) are able to scan them. NFC (Near Field Communications) is an emerging technology that is already used for contactless credit card payments, and is going to be used for mobile phone wallet payments. You may already have seen Barclaycard adverts where people swiping their phone against credit card machines to pay for goods. We are using the same technology in this new timing solution.If you don’t own an Android phone, then you can pickup a new or used compatible handset for a reasonable cost. Our solution is suitable for all kinds of events; walking, running, trail, cycle races or ultramarathons. Even cycling events. Any event where competitors will stop briefly to visit manned checkpoint, and can have their chip scanned by a smartphone as they pass through. You can purchase and download the Beyond Marathon Race Timer Pro App from the Google or Play store (£4.99). A demo version with less features is available too. Using the app is incredibly simple. It takes 2 minutes to learn it’s features. You can manually enter race numbers or scan bar codes for no more cost outlay at all. Or you could opt to use chips, which are actually NFC tags. NFC chips can be disposable stickers, right through to keyfobs or reusable wristbands. They can be purchased from many places for a low cost. They can be programmed with useful data using the free Android App Tagwriter. Once you add some data onto a chip, to read it, you simply scan the chip by opening the app and putting the phone close by. The App displays the details stored on the chip (Race number, name and other details) and stamps the current time and records the participants position in the event. The App of course allows race numbers to be manually entered via a keypad (in the event a participant loses their race number / chip). The compelling and unique selling point of this race timing system is that you are not restricted encoding chips only with a race number. The NFC chip can hold any information that may be useful to the race organisation: race number, name, age category, course details, emergency contact phone number (ICE), and medical conditions are just examples. So, you can see a lot of valuable, and race safety info can be added, which is a lot more than any other typical timing systems can offer. We can encode the chips with anything you like. When a participant comes into a checkpoint, their timing chip is scanned using the smartphone app; this takes less than 1 second. All of the participant details you asked for will be immediately visible to the marshal. Imagine the value of having emergency contact details or medical needs immediately visible? Also the marshal is able to tell the participant, at a glance, how far they are behind the person ahead of them. Something I’m sure you get asked all the time! Don’t forget, the primary reason for you checkpoint is really race safety. You want to be sure you have logged a participant as having passed through your checkpoint, and know what time they went through in the event that they fail to arrive at a later checkpoint. Physically Scanning a chip, removing the possibility of human error in recording, and then having time-stamped data to hand is invaluable. I can certainly say as a Race Director myself, that I rest a lot better knowing that I am properly logging the participants progress through checkpoints. At any point in time during the checkpoint operation, or once all participants have come through the checkpoint, you can send all of the data straight from the app, via email, to anywhere; perhaps straight back to the event HQ, or maybe to the next checkpoint on the course, so they know roughly what order participants could arrive; another key point to help race safety. The data is of course permanently stored on the smartphone until you choose to clear it out. Even if you have no mobile signal at the checkpoint, the data will remain in the app , and you can send it when you get a mobile signal again. Of course, there is nothing to stop you publishing the timing splits straight from the App on your phone right onto a website or onto social media. Or perhaps once the data is sent to HQ, you as Race Director, can use that it those updates to your website, or to Facebook and Twitter whilst the race is still on-going. You will later use it to compile checkpoint splits and produce the overall race results. You can learn more about how it works by clicking here or read about how it was used on a 50 mile ultramarathon. Our advice is always free. Contact Us and tell us about your event.